Of all the ways players taunt each other in fighting games, there’s no taunt as stylish as the trumpet solos that players can pull off in Skullgirls. Players can perform as police-officer-turned-brass-instrument “Big Band” and have used him to play an impressive array of songs, from James Bond’s theme to “Song of Storms” from The Legend of Zelda, in between beating up their opponents. A taunt is any move that doesn’t necessarily deal physical damage to your opponent, but instead serves as a performative show of power and finesse. Taunts are usually low-effort moves. In many games, they require just one button-press to perform. These moves are controversial since they seem to only exist to make other players feel demoralized. Shouldn’t fighting games encourage honor between players as opposed to mockery? Big Band’s trumpet taunts serve as an exception, since they require a level of musical finesse that even the sorest loser should appreciate. Players have been doing impressive things with them since the character got added to Skullgirls in 2014. Unlike most one-button taunts, Big Band’s multi-note trumpet solos demand as much advanced practice to pull off as any other fighting game combo. Plus, the trumpet solo encourages player creativity and improvisation, since players can compose their own musical beatdowns ahead of time or freestyle on the spot. All of Big Band’s attacks in Skullgirls involve music, and most of them play super-powered notes from his various instrumental appendages. His standing medium punch pulls out a trumpet to play one note. Pressing other buttons allows Big Band’s trumpet to play a full chromatic scale. Pressing up and down as you play notes will allow for octave-switching, as well. According to Big Band trumpet tutorials, like this one written by a bassoonist, the light, medium, and heavy button inputs line up similarly to the orientation of the three valves on the trumpet. Big Band can fire up his trumpet at any time during the game, not just in the middle of the Satchmo Solo, but the Satchmo Solo safely allows for a lengthy musical solo in the middle, plus safe ways to combo out of the move. If players want to play another full song during a match, they usually fire off a quick solo at the very end of a battle, while standing over their knocked-out opponent. There’s no in-game benefit to doing any of this, since these trumpet solos deal negligible damage. It’s just a flashy way to show off while playing as Big Band. 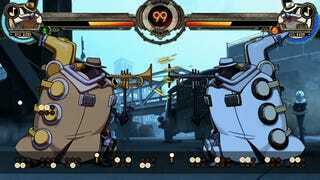 Few fighting games have attempted anything as creative as Skullgirls’ trumpet solo opportunities for Big Band. R. Mika’s monologuing and mic drop taunt in Street Fighter V feels similar, since it has the same sense of performative fun, but there’s no room for improvisation (if only! ).